Mad scientists do some pretty dopey things for such “smart” guys. For starters, it’s pretty irresponsible to try to reanimate dead bodies. Think of all the morticians mad scientists would put out of work if they actually succeeded at this. And anyone could tell you that building a teleporter is a bad idea. Forget about getting turned into a fly-man -- what about all those millions of other little creatures that live inside your body? Do mad scientists really expect us to chance being transformed into a disgusting eyelash mite monster? Dumb! But like so many other shortcomings, being a deranged technocrat can totally be compensated for if you’ve got a great head of hair. 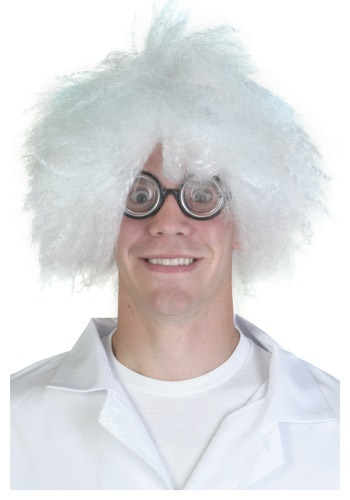 The Mad Scientist Wig is made from 100% synthetic white hair, so you can live with yourself knowing that no mad scientists were harmed in the making of your costume.